Home > Chiropractic Care: Apex Chiropractic & Wellness Center: Cincinnati Ohio > Children and Learning: Improving Through Chiropractic Care > Think BIG – A Brain Building Program: Is your child struggling with behavior, learning or sensory challenges? 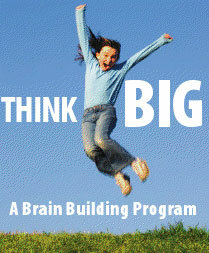 Think BIG – A Brain Building Program: Is your child struggling with behavior, learning or sensory challenges? Maximize your child’s potential with a comprehensive drug-free approach. In Think Big, we customize treatment plans to fit the needs of each individual. Our brain- building approach includes chiropractic, nutrition, and at-home exercises to promote proper neurologic development and function—which will enable your child to reach his or her maximum potential. Traditional medications don’t always work for neurodevelopment disorders. Even when they do, parents have a right to be concerned about undesirable side effects. If you are looking for a comprehensive, non-invasive, natural approach to your child’s health, you will find it at Apex Chiropractic and Wellness Center. Click here to learn more about Think Big and Neurodevelopment Disorder. Every child deserves a chance to reach their maximum potential. Call to schedule an evaluation: contact Dr. Laurie Jahnke at (513) 931-4300, located at 8624 Winton Road, Suite B, Cincinnati, OH 45231, less than a mile from Ronald Reagan Hwy. Disclaimer: Please note that we do not diagnose or treat neurological developmental disorders; We focus on enhancing your child’s proper neurologic development and function with chiropractic care, nutrition, and neurosensory integration. Stop smoking in 3 days! Learn about our program to stop smoking in 3 days! Get our Free Report on Attention & Learning! Fill out this short form to get your report! Is your child struggling with behavior, learning or sensory challenges? Maximize your child's potential with a comprehensive drug-free approach. • What is a Neurodevelopment Disorder?